I have here a version of rempah fried chicken the Malay way which has pleased many of my guests. It is actually quite simple to make. And it goes very well with nasi lemak. The first step involved is marinating it. Use ground spices and the fresher they are, the better. Buy fresh grounded ones or use seeds and grind them. Like coffee beans, spice seeds just keep the flavours better, especially in our humid tropical weather. As for the chicken, cut into larger pieces. The drumsticks and wings should be kept whole. Larger cuts help to keep the meat moist inside with a crisp exterior as you deep fry. Adding salt and sugar, you mix the spices into warmed coconut milk. When cooled, marinate the chicken pieces and leave it overnight or at least for 4 hours in the fridge. As I am not making a thick crust, unlike southern fried chicken, I do not use a thick batter. Just coat the chicken with flour lightly before frying. Blend the spices if you are using seeds. Then add into the coconut milk along with the salt. Warm up the milk to ensure the flavours are infused. When the marinade has cooled, marinate the chicken pieces over night or for 4 hours at least. Heat up the oil in the wok or the fryer. 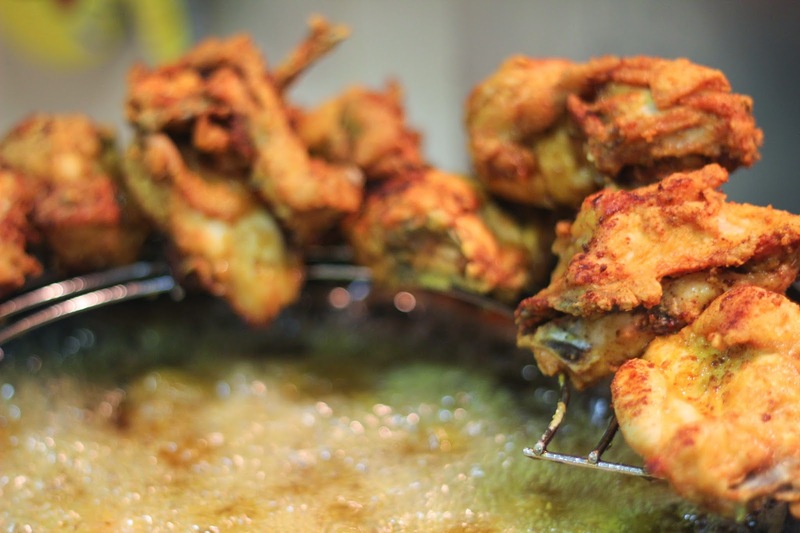 Use peanut or veg oil for its higher smoking point (don't use Canola or Corn oil to deep fry). 325ºC is the ideal temperature; I normally don't bother to use the thermometer but the oil has to be hot enough (but not smoking). You should hear a sizzling sound and bubbling when you put a piece in. If the heat is too low, the outcome will be soggy. 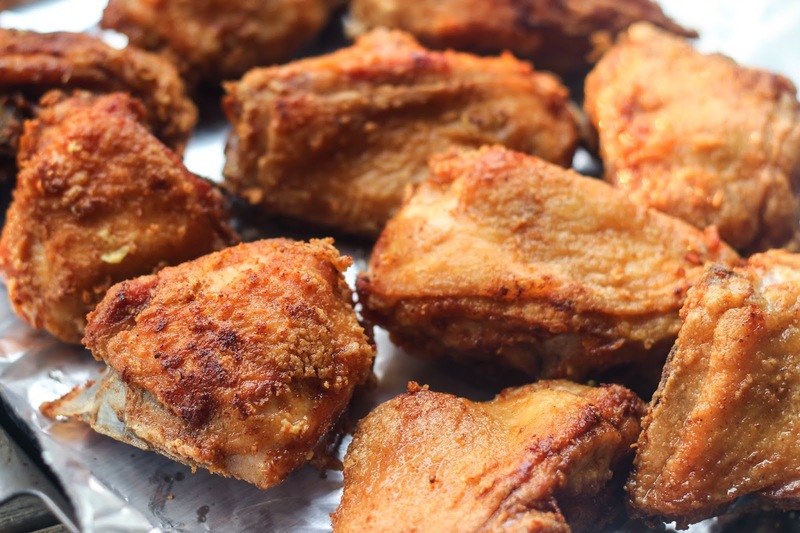 Coat the chicken lightly in corn flour and deep fry in small batches (about 4-5 pieces) for about 7-8 minutes till you see the pieces turn golden brown. Thigh meat will need about 2 minutes more. I sometimes separate the thigh and great meat pieces and fry them separately (see photos below). Remove the chicken pieces and place them on paper towels or a colander to drain the oil. 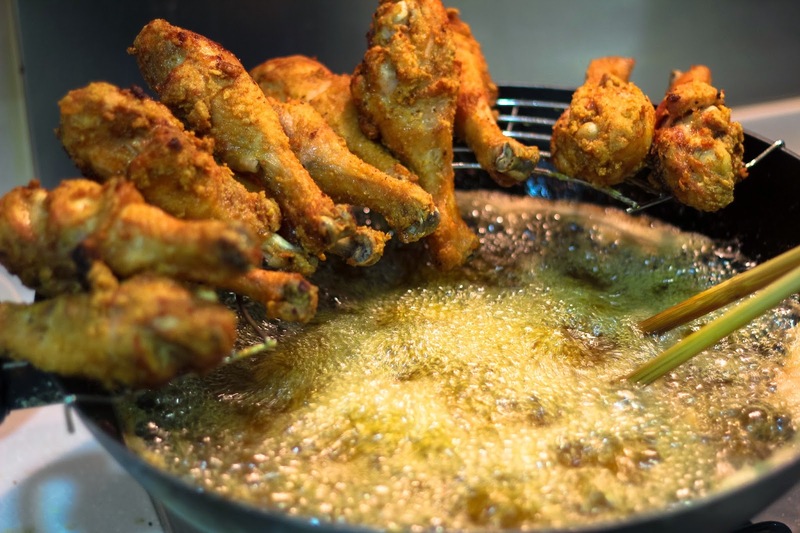 Dredge the oil in between batches to keep the oil clean and to avoid having the crumbs competing for the heat as you fry the chicken. If you are serving it later, keep it warm in a warmer or using the oven as a warmer. Hi, just confirming that for '1 t', you meant '1 teaspoon' correct? How much sugar do we need to add? I did not add any sugar. This recipe is SO GOOD. I use it for BBQ all the time - without the coconut milk and corn flour. I came across your blog serendipitously on the rempah chicken. I like adding coriander, cumin, turmeric and fennel to chicken for grilling but never thought about marinating the chicken in coconut milk. I will definitely try marinating the chicken in coconut milk.